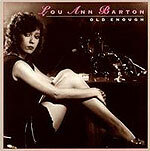 This reissue in CD format of an out-of-print 1982 release by Texas blues singer Lou Ann Barton is a welcome addition to her more recent Antone's recordings. This sultry R&B classic, produced by Glenn Frey of the rock band The Eagles, features Frey and Jimmie Vaughan on guitar, the Allman Brothers' Bary Beckett on keyboards, and the Muscle Shoals horn section. The music is classic Stax/Volt southern R&am;B, with a singing groove and Barton's signature voclas  her deep, husky voice adding even more oomph to the music. Kudos to Antone's for reissuing this.